DQ Entertainment International Ltd, N K Industries Ltd, Parsvnath Developers Ltd and Simbhaoli Sugars Ltd are among the other losers in the BSE's 'B' group today, 11 April 2019. 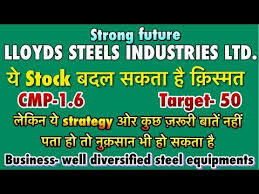 Lloyds Steels Industries Ltd crashed 10.23% to Rs 0.79 at 14:33 IST.The stock was the biggest loser in the BSE's 'B' group.On the BSE, 15.19 lakh shares were traded on the counter so far as against the average daily volumes of 8.92 lakh shares in the past one month. DQ Entertainment International Ltd lost 10.00% to Rs 8.91. The stock was the second biggest loser in 'B' group.On the BSE, 9288 shares were traded on the counter so far as against the average daily volumes of 13231 shares in the past one month. N K Industries Ltd tumbled 8.82% to Rs 38.25. The stock was the third biggest loser in 'B' group.On the BSE, 1001 shares were traded on the counter so far as against the average daily volumes of 2827 shares in the past one month. Parsvnath Developers Ltd plummeted 8.39% to Rs 5.24. The stock was the fourth biggest loser in 'B' group.On the BSE, 35636 shares were traded on the counter so far as against the average daily volumes of 79402 shares in the past one month. Simbhaoli Sugars Ltd dropped 7.86% to Rs 10.55. The stock was the fifth biggest loser in 'B' group.On the BSE, 1418 shares were traded on the counter so far as against the average daily volumes of 4676 shares in the past one month.